Palace Station is an off-Strip property that still puts you within minutes of it. Affordability, while still providing quality, is what keeps making this resort a continual local’s favorite. One of the finest oyster bars resides in Palace Station Hotel. With counter seating only, patrons watch as chefs prepares fresh seafood in front of them. The menu offers an array of lobster, crab, and clam dishes. Other great dining includes Guadalajara, featuring traditional Mexican fare, Pasta Palace, featuring the bargain all-you-can-eat pasta special, and Chang’s, a Chinese restaurant. During the day, you can soak in the rays at the pools or Jacuzzis. At night, great entertainment is featured at Sound Trax where seasoned vocalist Earl Turner performs. His routine will have you on your feet as you dance the night away. 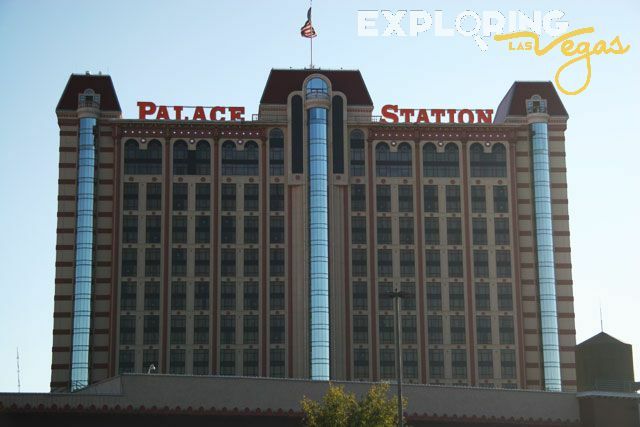 Although a smaller casino, Hotel Palace Station still offers an array of table games and over 2,200 slot machines. There is also a 600 seat Bingo room and 210 seat race and sports book. Yes, there is one garage. Pool, shuttle service, western union, fitness, business center, gift shop, concierge service, gaming, meeting space. Cable TV, free internet access, free local calls, in-room safes, hair dryers, dataport phones and ironing boards. 1,600 slot/video poker machines, table games : BJ, Let It Ride, Pai Gow Poker, craps, roulette, baccarat and Pai Gow Tiles, non-smoking poker room, race & sports book, keno lounge. Broiler, Cabo (mexican), Feast buffet, Grand cafe, Chang's, Pasta Palace, Oyster Bar, Starbucks, Subway. Sound Trax is a 175 seat entertainment venue and lounge, Trackside Bar, Trackside Bar.